Psitta-Social: Melbourne Meet ups Gain Critical Mass! February 9, the Melbourne parronts and fids held their greatest gathering yet! As the photos and videos show, parrot-lovers of all ages, and feathered friends of many species gathered in a cool great room on a hot summer's day, and reveled in one another's unique, treasured presence. Hop with excitement, oh, ye feathered friends! (Courtesy … Continue reading Psitta-Social: Melbourne Meet ups Gain Critical Mass! Psitta-Social: No Stopping Sydney Birdies! One can hardly keep pace with the Sydney Birdie Meet Ups group. After only two Play Dates, the group already numbers 152 (parront) members! Most recently, Sunday, January 20th, the group held their Second Play Date at the gracious home of Shantel Telly Byrd. Owner of Yoshi's Feathered Retreat and zoology student, Shantel excels at … Continue reading Psitta-Social: No Stopping Sydney Birdies! The first Saturday of December gay galahs and crafty cockatiels gathered -- from Wagga Wagga to Wollongong -- and descended on the unsuspecting Canberra, Australia's Capital city to make merry the month! Under the leadership of Adrienne Bennett (@birdsocialsoz (IG)) and eclectus CharlieBirdUrquhart, meeting on social media at the Facebook's Canberra Parrot Meet Up, this … Continue reading Christmas Fun in Canberra! Psitta-Social, Nov. 24: Kiwis Courageous! Another great meetup in Auckland this past Saturday, with lorikeets, an Indian ringneck, ecltecus parrots, and Senegal and African Grey parrots! To learn the details of the next Auckland meet-up, contact Facebook's Clive Willgoss or Ann-Sophie Salomez! These parronts and fids are eager to meet their bird-loving neighbors, and as you can see there's a spacious … Continue reading Psitta-Social, Nov. 24: Kiwis Courageous! An educational avian news ezine. We publish the third Saturday of the month, with additional pieces in between, especially social club announcements on our Psitta-Social page. News of bird issues throughout the world. Let us know the news that is important to you! Share your news and concerns with us! On social media platforms FaceBook and Instagram tag us @BirbObserver. Submissions on FaceBook may also be made via the Group BirbObserver. Please join us there and share your bird news. This is our Rescues and Sanctuaries page. If you have a favorite rescue you would like featured, please let us know!!!! Learn about birds on a species by species basis. 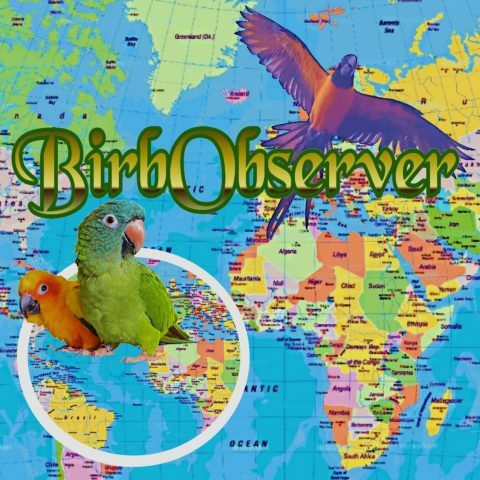 We would love to have regular contributors from the birdwatching world here. Still an open submission page for the arts, we also publish at monthly feature of a bird artist. This is the Editorial page. As our editor is both attorney and former pastor/chaplain, the emphasis is on legal and policy matters. We welcome your Letters to the Editor.